Stress is very debilitating in our daily life. Much research connects our health and wellbeing directly to the level of stress and our ability (or inability) to manage it. 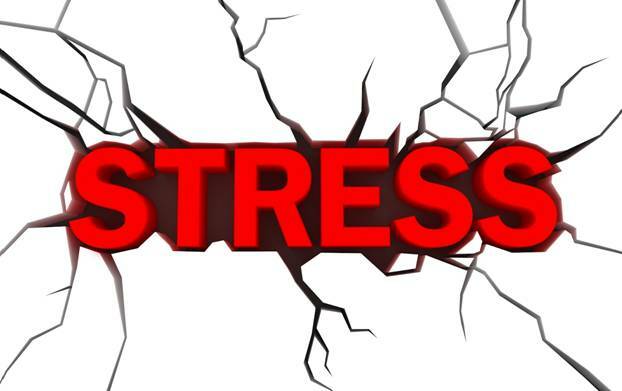 Stressed people are sick more often, have more conflicts, more relationship breakdowns and are less effective at work. These things result in earning less money, so they live in this vicious cycle that each point of pressure only feeds more pressure on other areas of life. Like I said before: Catch 22! Pressure is related to something specific. Stress is the result of accumulated pressures. When these pressures go over a threshold, it’s too much for us to handle. We go into stress and turn our focus from control to feeling helplessness and anxiety. In life coaching, it is very important for people to recognize that they are under pressure and that when it accumulates, it creates stress and then they are anxious about the outcome or the future. The three feelings of pressure, stress and anxiety go hand in hand in people’s reaction to events in life. I call them brothers, because they come from the same family of fear and in that family, they appear in this order. First, we have pressure, which accumulates and turns to stress, which immediately creates anxiety about the future. In this post, I will give you 3 strategies to find your sources of pressure and eliminate stress in your life. If you follow them, in the order they are presented, you will find relief. At first, it will be a small relief, which will accumulate. The same as pressure, accumulates and turns to stress, relief accumulates and turns into control. If you want to understand the science of it, consider every pressure as it pushes you towards survival (“fight or flight”) mode. Pressure is just a small fright, but when it accumulates, it becomes a big fright, your primitive brain takes over and all you can think of is attack of run away. In primitive times, we needed this to survive lions and snakes, but in modern times, we have this reaction to something someone said to us, which clearly isn’t life threatening. When we are continually stressed, we are edgy and the brain goes into this mode of survival fast. I am sure you have had experience with being snappy and find it hard to think when you haven’t slept for 24 hours. At first, you are tired and then you are more tired and every hour that goes by, you feel more and more tired, until it hits the stress button and you are no longer friendly and accommodating and willing and loving. So, think of living under pressure as constant interruptions to your sleep and stress as lack of sleep. Give it a name and write it down on a piece paper or in your mobile phone. If you are dedicated to the process, write down the circumstances and then write the feeling. If you don’t think you can remember to do it, put an alarm in your mobile/computer every hour to pop up and remind you to ask yourself, “What is the feeling I have right now?” If you are a very stressed person, do it every 30 minutes of your waking hours. After 3 days, you will be great at it. Some people will find it hard to write down what causes their pressure, because it accumulates and reaches a peak where it is too stressful, turns on the primitive brain and makes them see snakes and lions everywhere. As I said, when you are in that state of pressure, it is hard to see exactly when the lion came from, or what led the snake to you. If that is you, you will have to examine aspects of your life when you are calm and relaxed, in a comfortable place, by yourself or surrounded by loved ones and people who support you. Only in the thinking state, you can find the sources of pressure in your life. I know that when you are in a good state, you don’t want to think about pressure and stress, but trust me, it is a good strategy in general to review things and make decisions when you are in a clam state and not when you are in the middle of a heated situation. Next to each score higher than 5, write down what or who triggers the pressure. You may find it hard to do this and won’t know exactly what it is, because it can be a delayed reaction to something that happened 4 days ago, but over time, you will get better at it. Once you are done, ask yourself, “Is this pressure coming from the outside or inside?” Remember, outside pressure means that one or more people expect you to do something you find hard or impossible to do. Inside pressure is when you expect yourself to do hard or impossible things and you are being critical of yourself. It is important to find out if the pressure comes from outside or inside, because this will determine the elimination strategy. Group your pressures and sources of pressure. When making a list of pressure points, it is easy to find out that some of them are in fact the same issue with different presentations. When we make a list, we think we have lots of pressures, but when we group them, our list will become much shorter. Why is this important? Because it helps us focus on what needs to be changed. For example: I feel pressure from the kids to buy things, I feel pressure from my partner to stop spending and I feel pressure when I want to buy myself something that I consider too expensive. All of these stressors are in fact one financial pressure that clutters every decision about spending money. It is easy to work on this as one issue. I can set a budget for everything and then I can stick to the budget and use it to deal calmly with my partner and my kids. The decision to buy something will no longer be emotional. It will be a choice. So, if this year has enough budget for shoes, I’m going to buy them. Easy! Once you have this list, you will be able to make some changes. Join me next week for facts about stress and pressure. In the meantime, remember that happiness is a choice!